Leaving the snow and 20 degree weather behind was quite enjoyable once we landed at Luis Munoz Marin International Airport in San Juan. We were greeted with warm tropical breezes, an abundance of flora and fauna and the friendly welcome of Puerto Rican natives. Our ride to the Wyndham Rio Mar Resort was scenic and allowed us to immediately soak up the culture of our new environment. Everyone we encountered greeted us with a friendly “hola” as soon as we arrived. I really should have brushed up on my basic knowledge of Spanish! Even though I tried to use what little I remember, I was unable to fool anyone because they instantly translated everything they said in Spanish to English for us. After check-in, we made quick friends with some of the resort staff who gave us the scoop on the best non-tourist local favorite activities and restaurants. We planned to try and take in as much as possible while still taking advantage of much needed after-wedding relaxation. Today we decided to just completely relax and enjoy the beautiful grounds and scenery of the resort. After a delicious breakfast at The Mirabella Cafe, we hit the beach to soak up some sun. Unlike most islands in the Caribbean, the waves on our beach in Puerto Rico were surprisingly challenging! We had a blast catching wave after wave and really enjoyed swimming in the crystal blue sea. We spent the day bouncing from the beach to the pool to the hot tub and we felt great! The offerings from the tiki bar were also a nice touch! A major natural feature here on this enchanted island is the abundance of large iguanas and the nightly chirping of the “coqui” frogs. We searched and searched for some coqui but were unable to find any. The iguana population was a different story however. 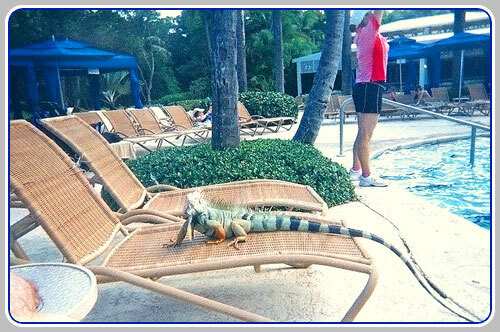 We had one we named “Henry” who hung out with us by our favorite pool location. He decided to join us on the next lounge chair over so he could sunbathe with us. My husband was just a tad intimidated by his constant stare, but Henry was good company. After a nice day of swimming and sunning, we went to dinner at “Palio’s” – an upscale Tuscan-Italian cuisine style restaurant. The ambiance was romantic and elegant and the meal was spectacular. Our only complaint was that the restaurant was filled with screaming children who disturbed our honeymoon mood quite a bit. This restaurant was very pricey and for what we spent for our meal it should have been less McDonald’s atmosphere and more luxurious and peaceful. Overall, our day and evening were great at the Rio Mar. We caught an early shuttle over to Marina Puerto Del Rey to board the “Wave Runner” catamaran. The sea was very choppy and rough for the 40 minute ride out to the snorkeling spot off of Culebra Island but we still enjoyed the ride. The reef was beautiful and full of colorful tropical fish and different types of coral. After an hour or so of our snorkeling adventure, we got back on board to head over to our next destination. 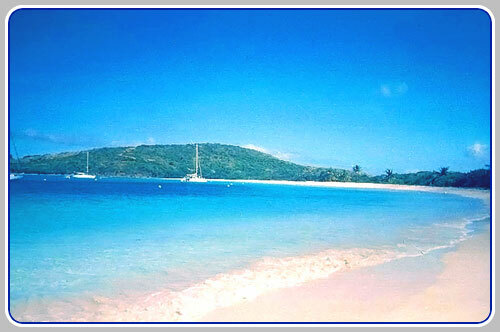 We were originally scheduled to have lunch on Culebra Island at Flamenco Beach. Because of the very rough tradewinds, it would have been impossible for our catamaran to moor, so the staff of the Wave Runner decided to take us to a remote, private island with an isolated beach that is known to be a favorite of local Puerto Ricans. When we returned to our resort, we enjoyed a delicious dinner at the Asian-Fusion restaurant “Shimas.” The food was fresh and priced right and it was the perfect end to a perfect day! 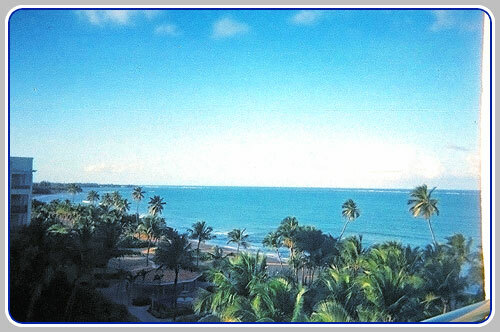 Since this was our last full day in Puerto Rico, we decided on another day of relaxation. We once again fought the ocean waves, enjoyed drinks at the tiki bar and walked around the beautiful property of the Rio Mar Resort. That evening, we took a little shuttle over to the Rio Mar Country Club for dinner at the “Iguana Pub” for some authentic island food. We had a nice view of the golf course on one side and the El Yunque Rainforest on the other. It was a full moon and the view was breathtaking. We dined on tostones, rice and beans and a nice skirt steak with Chimichurri sauce which did not disappoint! We returned to the main resort and played in the casino for a little while. I had a mild win and decided to quit while I was ahead, so we went back to our room for one more night on our balcony overlooking the beautiful ocean. We were fortunate enough to get a late check out, and since our flight back didn’t leave until after 5 PM, we were able to hang around the resort for a few more hours. We sat by the pool for a little while, said our goodbyes to Henry and then made our way to the Mirabella for a nice lunch. It was very difficult to go from shoveling sand to shoveling snow, but we thoroughly enjoyed our honeymoon in Puerto Rico and at the Rio Mar. We are already planning to return for our one-year wedding anniversary so we can explore the island some more. It was a great choice for our honeymoon and we can’t wait to go back!